An update to Vol. 2, pp. 674–697. Several short excavation seasons were conducted in 1998–2000 at the Second Temple period winter palaces in the area of Tulul Abu el-‘Alayiq in Jericho. 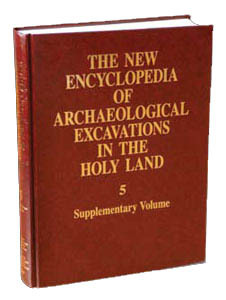 The excavations were conducted by an expedition of the Hebrew University of Jerusalem under the direction of E. Netzer, with the assistance of Y. Kalman and R. Laureys-Chachy. The work concentrated upon the area east of the twin palaces, the area northeast of Herod’s second palace, and the workshop area. THE OPEN-AIR TRICLINIUM. A broad U-shaped plastered couch or triclinium of the Hasmonean period, built in two phases, was exposed in the courtyard adjoining the eastern side of the twin palaces. A recess in one corner of the initial phase of this structure contained evidence for a tree root c. 70 cm in diameter, indicating that the triclinium was constructed in this spot to take advantage of a date palm or some other tree that provided shade. The inner side of the couch bears remains of a fresco decoration. During its second phase the structure was extended to accommodate more diners. THE SYNAGOGUE COMPLEX. Most of the main wing of the second palace was fully exposed, including the central part of its courtyard—the garden—elevated c. 80 cm above the surrounding colonnades. An outstanding discovery was made under the northeastern corner of this wing, where a synagogue complex from an earlier, Hasmonean, stage was revealed and fully excavated. The complex is located at the edge of a row of mostly unexcavated buildings, which extended from the Hasmonean palace complex to the workshop area, next to a branch of the Na‘aran aqueduct. Dated to the end of the reign of Alexander Jannaeus, these buildings apparently accommodated the administrators of the adjacent royal estate.